After some general dryfitting and fettling around with the kit over the last few days I thought Id share some of my findings. Horizontal stabilisers are a good fit. A minor amount of filler may be required but thats all. On a dry run I found that the leading edge was sitting back about 2mm (1/16th inch). Shaving away some of the plastic around the area that the forward spar section slides into quickly resulted in a lot better fit. Again, some minor filling may be required around the wing root area but nothing too drastic. As you'll have seen from the earlier photo, the hinges need a fair amount of work to get them to fit into the grooves in the wing. One thing that will need a bit more drastic action is part 174, the flap hinge nearest the fusalage. The two parts are moulded the same, but should actually be "handed". The square area is baised to one side of the hinge. Consequently this will only fit one wing. It shouldnt be too hard to cut the square off and "spin and pin" though. The gun bays and, in the case of the port wing only , the ammo tray, fit well on a dry run. Two versions of the ammo trays are supplied. One with bullets and one without. Im undecided which,if any, to fit at the moment. Moulded plastic bullets in a wing never seem to look very good in my eyes, and I cant see much point in displaying an empty tray. The gun sleeves supplied with the kit are solid, and I'll either drill these out or look at replacing them with with some metal tubing or AM products if I can find any. Quick question if you don't mind ? Personally I think the VFS kit has a very good representation of a 2800. There are a couple of things that stand out, the offset way the engine sits is a real shame, but thats the only major thing that stands out imho. The magnetos in the kit were fitted to the later C series P+W and are incorrect for the D25-D28 that the first VFS kit represents, but thats getting into rivet counter territory. I'd agree that the mounting ring may be a little on the bulky side, but I dont think that it distracts from the general look of the engine. Heres a close up of the one on the Duxford Razorback. This engine features the same magnetos as found on a 2800-57 and 2800-77 originally, but I dont know exactly which mark of engine is fitted. When I asked the guys working on it all they knew was that its a "double wasp".The nose case is more akin to a B series. 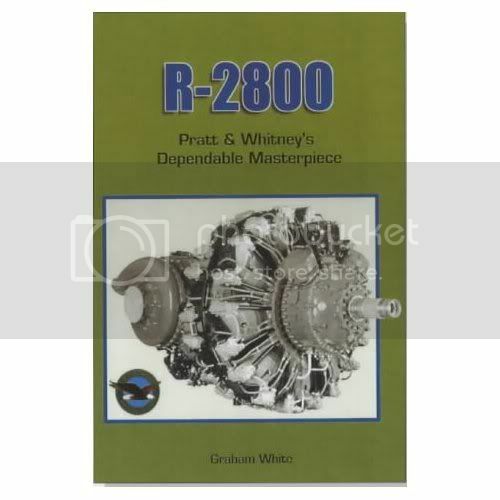 If you want to explore the P+W2800 then Graham Whites book describes each stage of its development down to the last nut and gasket. OK cheers Nige. I just thought the top of the head looked much more "Y" shaped in real life but as you say, its not far off. Im in regular contact with Ray and I'll ask him about that email address when I speak to him. I clicked "contact us" from his web page so it wasnt a mistake on my part. Hope he hasnt been credit crunched or i better grab a P-47 while i can !!!! Rays definately not been "crunched"..far from it. The other contact details on the site are current. You'll soon have even more temptation Allen, as the next release in the series is due to happen very soon. I didnt realise how long it was since I'd posted any progress photos. In between working on other stuff Ive been slowly working on the wings/gun bays. Finally got the starboard wing together today. I added a small amount of wiring in the wheel well. The wires on the right will feed into the fusalage and the one on the left will go to the strut for the inner gear door. Originally I was going to fit the Brownings after everything was together, but during a dryrun I dropped one and it dissapeared into the wing void. So to be on the safeside I glued them in position now. After adding the ammo feeds a final dry run before glueing the wing. Looking excellent Nige, I like the finish on the guns, is that dry brushing, pastels, or a wash ? Its Humbrol 53 Gunmetal. Then a dark grey waterbased wash. Over that is a burnt umber oil wash then silver drybrushing. Theyre sink marks yes. I have to spray the edges of the gunbay and blend it all together yet so I will dispatch the only visible sink mark when I do that. Mr Surfacer will sort that out, its great stuff. In between getting the fusalage fillet gap filled and looking respectable, ( im going to get all that area sorted before I attach the wings for ease of handling, Its bloody heavy,, ) Ive been tinkering with some of the other parts. As you may have seen in the Lorene threads, the main gear doors need some working on in these early releases. On Daves build he filled the voids in the gear doors. I've taken the other route of glueing some thin plasticcard over the area. When dry I trimmed it and filed a small angle to the edges. You'll probably have to also add some plasticard in the centre area in order to lift the main gear strut away from the door so its sits correctly too. Hi Nige: very nice job on the missing inner door pieces. What thickness of plastic did you use? I dont know exactly what thickness it is, just the thinnest size I had to hand. Hi Nigel. I've been dipped deep in work lately (we're shipping race bikes to the states, to whip the yanks with) so I haven't been very productive. I'm just taking a look around, and i have to say your empty gunbay (of all things) is the prettiest thing I've seen in a while. Weird I guess, but that's what my eyes tell me. Anyway, it makes you think about recoil. It was said in the SwAF that you should not fire your mustang .50's in level flight below 300 km/h (roughly) because you could end up below stall speed. Keeping looking around, hoping to finish the MX-E soon. Glad to hear your busy! Thanks for the comments on the gun bay. Im working on the second one at the moment. Ive also got a beading tool and rivet template to replace some rivets around the fusalage fillet and to also add some which are missing in a couple of areas. On the subject of recoil, I've read that on the earlier P-47's which didnt have the dive flaps( pre D-30), when the pilots were approaching the effects of compressibility a burst of the eight 50 cals would take approx 30 mph off their speed and help them to pull out of the dives. Some more general mucking about with the undercarriage today. I got a "beading kit" and a rivet spacer this week, and thought I'd test it out on a part of the airframe thats going to be mainly hidden by the wheels. Not the neatest lines of rivets Ive ever seen, but after a dusting of primer they look a lot more presentable. Oh yeah. That's perfectly ok. It's just amazing though, how many things that are parts in smaller scale that becomes subassemblies in larger. Sometimes I feel like I'm getting nowhere with this. Had a good day today though, finally happy with the fusalage fillet join and Ive redone the rivet lines.) one area was a bit wonky so I've filled ready to go over again. The top of the fusalage forward of the cockpit was devoid of all detail.